"Save labor with Supernova liners"
The Supernova liners were developed more than 20 years ago in cooperation with researchers at Michigan State University to ensure that small container crops have consistent and faster flowering for market. 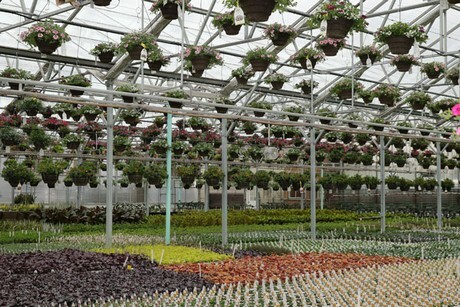 To do this, Four Star treats regular sized liners with a treatment of intensive lighting, spacing to encourage growth, pinching, PGRs and heat — all of which help the liners flower faster and on time. Bourdon explains, “These are not larger plugs with bigger soil volume. We don’t want that because you’d need more PGRs. This treatment is meant for Grande small containers, allowing each plant to have more branching and more flowers, in a much quicker time period. Like all Supernova Liners, the Golden Butterfly Argyranthemum plug shown here is a regular-sized liner that receives special treatment for faster flowering. Because the crops finish more quickly, many growers also have been able to finish plants early and add an extra turn every season, which can be a considerable advantage, he adds. Two of the main advantages of using Supernova liners is that they are faster to flower (saving production time) and they need less attention from workers (saving labor). Because these liners are pinched at Four Star, they do not need further pinching by the grower. In fact, pinching is not recommended because it would remove the initiated buds. The difference in a Supernova treated vs. standard liner plant can be seen in comparative photographs like those shown here. Supernova treated liners have thicker branching and faster, more consistent flowering. This allows growers to have beautiful crops ready for market with every turn. Supernova liners are offered as 52s, 50s and 28 Thrillers. The Supernova 52s are available in several popular varieties such as Angelonia, Calibrachoa, Petunia, Nemesia, Salvia, Verbena and others. Supernova 50s are offered in Infinity New Guinea Impatiens and SunPatiens Impatiens. 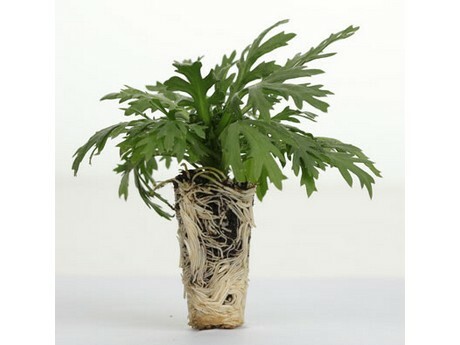 The 28 Thrillers are developed to support a larger, well-developed root system for larger containers. Supernova 52 Liners like these Supertunia White Charm Petunia have the same soil volume as a 104 Liner but are spaced every other plant in the tray to encourage more branching and flowers. Just as growers saw no difference in performance when they switched from 84s to 104s, they will see no difference in Supernova 52 performance, he adds. Another advantage is savings on shipping. “This new system is nice because those growers who receive plants shipped to them now save 20% on their shipping costs and have fewer trays to handle on arrival,” he notes, because the Supernova 52 format provides more plants per tray and allow more plants to ship per box. Grow Supernova Liners on in greenhouses heated from the mid- to upper 60s to finish on time, with full flowers and branching.